"Yes, Thompson can write a good poem about the rough-and-tumble lifestyle on the road or that outcast troubadour who doesn’t want to end up as the “local hero” poet. 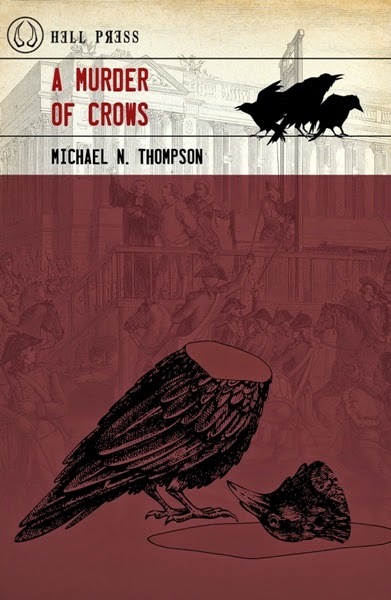 These are entertaining indeed and he can work the coffee- and whiskey-stained memories into a fine set of stanzas, but it’s when he explores a specific person, place, or theme beyond the poet that Thompson’s work separates itself from the rest of the jackal pack. The first poem in the collection that really sank in the claws was the Twin Peaks-inspired “Fire Walk With Me,” exploring the “would-be heroes” chasing after “an abhorrent devil” in the deeps dark woods of humanity’s night. Follow that with “Memphis,” a poem dedicated to (and seemingly told by) the late great Jeff Buckley, telling us “don’t let the ghosts I’ve exorcised / become sad laments.” What a hell of a request from beyond the grave. These standout poems light up the landscape of this collection like cities on the road-trip horizon, and there’s something wonderful that happens when Thompson takes the lines about loners and drifters and hard-asses and applies them to something greater than just another poet rambling around, to some social or cultural trope, weaving a greater mythos into the day-to-day—these are the poems that truly shine and stand out best in this collection. Michael C. Rogers, author of Dead Angels Bleed reviews This Hollow Pierces on April 21, 2010. More polished and somewhat less venomous than its predecessor, Dancing Inside the Mouth of Madness - This Hollow Pierces still packs a set of teeth. Thompson's sophomore effort doesn't disappoint. He tears open his heart for the world to see, allowing you into his world, giving the reader a strong sense of who the man is inside these poems. The Ninth of March is a standout cut, taking me back in time to my own beer-soaked gin-mill days. I knew and identified with Thompson's sense of disgust for what was around him from the vantage point of a bar stool. This is the essence and entity of a man who's lived a colorful, yet tortured existence. The man has seen life from many different perspectives, and he distills them down into a language everyone can understand and relate to in his poems. This Hollow Pierces shows us the poet of Dancing Inside the Mouth of Madness coming into his own; progressing - articulating his emotions and channeling his feelings into well crafted verse." "This poetry nails you to a cross, then when you least expect it, thrusts a spear into your gut and leaves you to bleed, emotionally, from the pain innocents in this world have endured. Very powerful work." - Lisa Powell, author of The Diary of Lisa Lansing. "There are ways that some poets have of stringing words together no matter how painful a past those words represent, that makes one feel like they are signing when they are reading the words. I felt like I was singing when reading this and that is a sign of a true tale." - Gray Anderson, author, Mind Sleep and Maid For Seduction. Michael Thompson is a soulful poet who brings the mind, body and spirit connection to his craft. Best of all the reader closes the book better for it and maybe a bit corrupt. if you look high on heaven's hill you'll see this up and coming poet writing all his lessons learned in hopes of knocking at those gates and maybe getting in. Beth Jannery, author, Simple Grace: Living a Meaningful Life and Shut The Hell Up! 101 Reasons to Appreciate Your Life.